As the deficit spirals to record levels, there’s no shortage of politicians eager to cut the fat from the federal budget. What exactly constitutes “fat” is usually a matter of perception, and a proposal by Rep. Betty McCollum to end the Pentagon’s sponsorships of NASCAR race teams illustrates how even the smallest of proposed cuts can generate a lot of pushback. “NASCAR fans are the kind of people who fight America’s wars, which would put into question the wisdom of banning the military’s ability to reach out to them,” Poston told the Virginian Pilot. The director of the Army’s sponsorship also defended the program, telling the Wall Street Journal that the service finds it to be effective. McCollum, a Democrat from Minnesota, said on her website that sponsoring race teams while we’re proposing cuts in programs that support veterans and law enforcement is irresponsible. “Taxpayer-funded NASCAR race cars are an absurdity at a time when the Republican-Tea Party is cutting federal support for homeless veterans, law enforcement officers, and firefighters. I know NASCAR fans are passionate and patriotic. 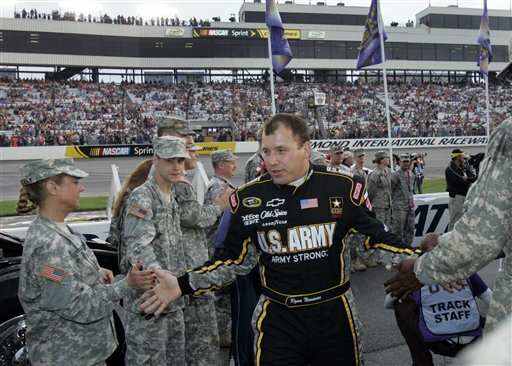 This amendment gets the government out of NASCAR and gives them the opportunity to encourage the private sector to demonstrate its patriotism by donating a military sponsorship,” McCollum said. What do you guys think? Are these sponsorships — more than $100 million in the 10 years DoD has sponsored race teams, according to McCollum — worth the money? Is it a wise investment for recruiting or a needless waste of taxpayer dollars? Veteran’s programs are being cut so NASCAR can race. I fully support Rep. Betty McCollum’s efforts to stop the funding of all NASCAR teams by DoD. This is one of the biggest hoaxes that continues to be perpetuated on the American taxpaper. Of course NASCAR is protesting. They will lose the approximate $20 million per car that is sponsored by DoD. This waste of money is done in an effort by various recruiting commands. How much is enough. It simply is not cost effective to recruit using this method. NASCAR is losing market share to other sports and attendence has been down recently. Could it be they have themselves to blame with mandates such as the Car of the Future II and retaining restrictor plates? That is not the American taxpayer’s fault. Also there should be no memberships or subsidies to any professional sport and it occurs more than one would like to think by DoD. I am not writing about television commercials. I speaking of team club memberships costing in the thousands of dollars annually. Again done with the excuse of we need this for recruiting. When was the last time Bret Farve produced one recruit? Also Accessions Command needs to stop spending $500,000 to have a major presence at the Chicago Auto Show and other similiar events. If approximately 100 enlistments were obtained for the Army, it cost the taxpayer $5,000 per enlistment. Not very cost effective. Current soldiers, marines, sailors, airmen, and coastguardsmen need to have our full support along with veterans who are going homeless and not receiving adequate care through the VA system. DoD needs to stop the egregious waste of money that all too many troops and DoD civilians see on a daily basis. another example of Socialism that the republicans believe in. this is the most elitist brand. 3 cars while 1000’s of vets see their benefits cut. If these fans are so patriotic they should be enlisting without having Dod and the tax payers having to sponsor a sport that many do not follow.